You can send messages with text, photos, and other files. Note: Before you can send messages, you need to Set up to send text messages. In the Messages window, click the Compose button to start a new message (or use the Touch Bar). Type a name, an email address, or a phone number in the To field. As you type, Messages suggests matching addresses from your Contacts app or from people you’ve previously sent messages to. You can also click the Add button to the right of the To field. Click a contact in the list, then click the email address or phone number. If you want to send the message to more than one person, see Send group messages. Text: Type text in the message field. You can use typing suggestions, if available. Tip: Press Option-Return to insert a line break in a message. Photos or videos: Drag photos (including Live Photos) or videos to the message field, or copy and paste them. Note: If you drag a Live Photo to your message, friends see only a still photo. If you want friends to be able to see the Live Photo play, share it from the Photos app. For more information, see Use Messages to share photos. Files or web links: Drag or copy and paste files or web links. Audio clips: If you want to record an audio clip in your message, see Send audio clips. Emoji: Click the Emoji button to add emoji to your message. If you add three or fewer emoji, they appear as large emoji. Ask Siri. Say something like: “Message Mom that I’ll be late.” Learn more about Siri. Tip: To forward a message (or an attachment such as a photo or video) from a conversation, Control-click it, then choose Forward. You can repeat this to forward multiple messages from multiple conversations at one time. When you add a recipient and press Return, all messages and attachments are sent. Your Mac can receive and send SMS and MMS text messages through your iPhone when you set up text message forwarding. 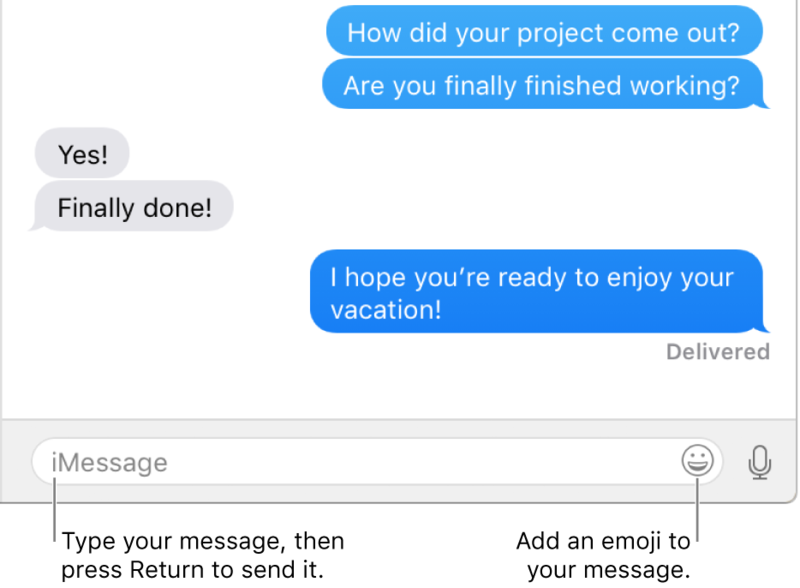 For example, if a friend sends you a text message from a phone other than iPhone, the message appears on your Mac and iPhone in Messages. iMessage bubbles are blue. All other message bubbles are green. Note: To receive and send SMS and MMS messages on your Mac, your iPhone must have iOS 8.1 or later, and your iPhone and Mac must be signed into iMessage using the same Apple ID. Additionally, you must set up your iPhone.